The FIDM Life: work your wardrobe at BR. 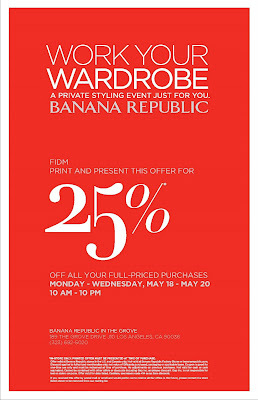 Banana Republic at The Grove would like to invite all FIDM students, staff, faculty and alumni to come into their store and enjoy 25% off all full priced merchandise you purchase on Monday, May 18th to Wednesday, May 20th. Just click on the photo to print the coupon and enjoy your shopping!